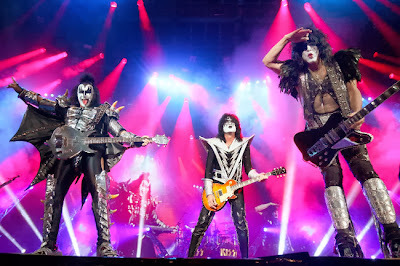 Gene Simmons, Tommy Thayer and Paul Stanley perform in Calgary, Alta. on Friday November 8, 2013 at the Scotiabank Saddledome. This concert replaces the show that was cancelled in July when the Saddledome was damaged during June floods. The band holds honours as one of America's top gold record champions, selling over 100 million albums worldwide in their 40 year career. KISS' career milestones are staggering, boasting decades of record-breaking tours around the globe.